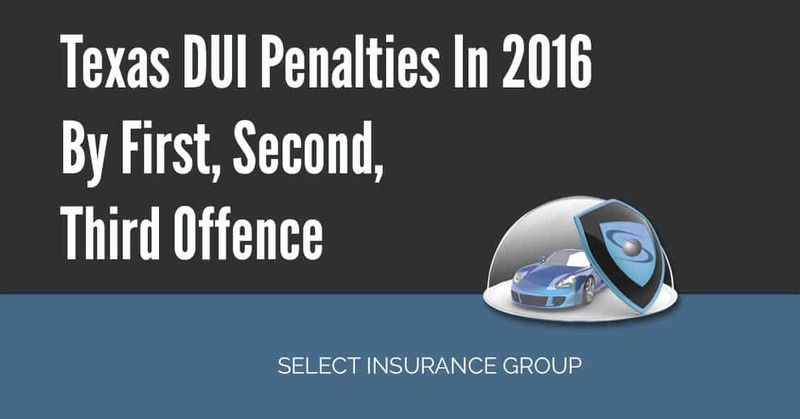 Texas DUI Penalties In 2016 By First, Second, Third Offence – According to the CDC, a total of 13,138 fatalities were recorded in the state of Texas between the years 2003-2012 as a result of drunk driving. That is approximately 1,314 deaths caused by drunken drivers. One cannot begin to contend with a single alcohol l related crash. Driving while under the influence of alcohol or intoxicated is never a good idea. Are you in Texas, in the habit of drinking and possibly take risks driving around while intoxicated? This article is especially written for you. First of all, you need to understand that the more DUIs you are caught with the worse your records get, the steeper the penalties and the higher your insurance premiums will get. Before one gets to the deeper issue of penalties, it is best to understand some basics of DUI laws in the state of Texas. Texas does not have a look-back period. It is easy to assume that since your last DUI several years have passed and therefore there is no way you can be sentenced based on your past DUI. Unfortunately, this is not the case in Texas. For instance, if you are caught with a DUI today and your last DUI was twenty years ago, the law will not recognize the passage of time as something to consider in order to pass the sentence. Effectively, the time that has elapsed will not make the court any lenient for you. The severity of the punishment will not be diluted by passage of time. Like many other states, Texas law also operates the ‘implied consent law’. This in essence means one can agree to or refuse to be tested. There are two types of tests that the officer can decide to let you take. Namely: Field tests or chemical tests. A chemical test may be either of the following; blood test, urine test or breath test. A field test may include, running test, walking test, one leg-stand among a few others. Note refusing to take a field test will does not carry any legal implications for you. However, remember, should you be taken to court, the officer will state the fact that you declined to take that test. Refusal to take a chemical test however, has legal implications on you. While it is your right to refuse such a test, the implication of your refusal may have far more reaching consequences. This is mainly because; there is an assumption that you declined the test because you were too intoxicated. You will also be slapped with instant penalties, which sometimes may be much more than if you had been convicted of a DUI and given lesser penalties. However, if you are too intoxicated, it may make a little more sense to decline the test. In short, you must understand just how intoxicated you are in order to decline or accept the test in a way that is favorable for you. If you decline to take the test the following penalties will be enforced on you. You will get a 2 year suspension on your driving license for a second offense. Offense number 3 will also earn you 2 years license suspension. If you accept to take the test; take the test as soon as possible. Also note that you have the right to take another test from a medical practitioner within the first two hours of your chemical test. This is recommended especially if you have an intention of challenging the accusation in court. Basically, the law has a lot of technicality and you may get off on a technical issue. You can challenge the specimen storage methods and containers. You can also question the condition of the specimen collected from you, from the moment of collection to the moment of testing. You can also put the spotlight on the machines used for specimen testing, their accuracy and if indeed they are they are of the standard as would be used in hospitals or private testing facilities. Challenging the blooding collection procedures is also an option you could take. It has been established in previous studies that the process is generally prone to errors and mistakes. You can also question their lack of reporting error chances in the tests. This is because the reports never report any errors, but the fact is any machine is prone to errors. For a person of 21years and above you will be consider DUI if your BAC is .08% or above. For a minor (a person under the age of 21years), a BAC of .02% will get you a DUI charge. If you are a commercial driver, a BAC of .04% will also land you in trouble. NOTE: If you are under the age of 21 years, you are considered a minor, and although you will not be faced by the same penalties faced by adults, you will be faced by steep penalties none the less. If your BAC is .02% and above, then operating a vehicle or boat will mean you are DUI or DWI. The following is what you will be facing should you be convicted of this offense. You will have to pay fines not exceeding $500. Your license may be suspended for a period not exceeding one year. You may need to attend alcohol management education for not less than twelve hours. 90 days licenses suspension and the requirement to install an IID in your car. Should you refuse to finish your alcohol management program, your license will be suspended for an additional 180 days. The state of Texas does not allow plea bargaining for offenses involving DUI. While many other states may allow you to plea bargain from a DUI to a wet reckless charge, the laws of Texas expressly prohibits of bargaining to a lower charge. However, you can bargain for a lower sentence once you have been convicted. Understanding these basics will help you decide if you really want to take the risk after all. However, consider the penalties as detailed below. Depending on your circumstances, your BAC levels and possible offenses you may have committed while DUI; you may be jailed for a period of between 3 to 180 days. You be given a fine of not more than $ 2,000. You may also be required to pay an annual fee of $2,000 to keep your driving license for a period of up to three years. In some cases, you may need to attend a DUI education program. Depending on your circumstances, court may order you to install a DII. If you are convicted, the court may send you to jail for a period of 1 month to a year. Your driving license may be suspended for up to a period of 2 years. There may be a requirement for you to attend DUI education program or intervention. You may also be required to install an IID. For a third time offender, you really are in trouble. You will probably be sent to jail for a period of between 2-10 years. You may be required to pay a fine of up to ten thousand dollars. You also have to pay an annual fee of $2,000 so that you can continue keeping your license. You may also possibly have to attend DUI intervention or education programs within the state. There is a high chance that you will be required to install an IID. Note: An IID (Ignition Interlock Device) is a breathalyzer sort of a device that is fitted into your car to ensure that you cannot drive the car in a drunken state. Once you get into the car, you are required to breathe into it. Should your BAC levels be higher than the state given limits, your car will not start when you turn it on. You will have to wait until your BAC levels have gone down to get the car started and moving. You may go to jail for a period of up to 2 years. You may have to pay a fine of up to $10,000. You could have your driving license suspended for up to 180 days. As stated, while the court may be lenient with you in other circumstances, a DUI involving a child is not one that anyone is really willing to listen to. The state of Texas recognizes vehicular manslaughter or intoxication manslaughter as an independent offense. Intoxication manslaughter occurs when an intoxicated person causes the death of another by operating a vehicle, airplane or boat. Intoxication in this case may refer to being under the influence of alcohol, controlled substances or even prescription drugs. Whether the person who dies is a passenger, a pedestrian or a passenger in another vehicle is of no consequence. What is important is that someone dies in the crash. Vehicular manslaughter is rated as a second degree felony in the state of Texas and also has a mandatory minimum number of years one can serve in jail. A conviction arising from this offense may see you behind bars for a period of between 2 -20 years. Texas laws advocate for a fine of up to $10,000. You may also have to serve up to 800 hours in community service, with the minimum being 240 hours. Generally, once you have been convicted of a DUI in Texas (even once), you have been qualified as a high risk driver. In most cases you will have your license suspended. Sometimes a court or the DMV will require you to acquire a SR22 for one reason or the other. This is a document used to prove that you have auto insurance, you are who you claim to be and in case of an accident or incident where you are involved, you will be in the financial position to meet the expenses that arise from the said accident. You may also be required to get a SR22 when trying to get your license suspension lifted. This document is provided by your insurance provider. However, all auto insurance companies offer this service and you may be forced to shop around. This requirement however may be a headache for you as you may need to dig deeper into your pockets to meet your insurance premiums. An SR22 requirement automatically raises your risk levels, therefore your insurer is usually forced to hike your insurance premiums as it is hard to know what kind of damage you may because the next time you are DUI. You may need to hire the services of a lawyer and meet other incidental costs that come with filing or attending to your court sermons. You will be required to pay for DUI education and make a donation towards DUI awareness programs like M.A.D.D. If you are in the tendency of DUI then, you need to be prepared to meet these extra costs too. DUI is not only a danger to you and others, but to your bank account too. However, should you find yourself in a situation where you need an SR22, talk to us. Our specialty is high risk insurance. While you may be confused about how to handle your case, all you need to do is be candid with us. We have the resources, the ability, the knowhow, capacity and willingness to handle your situation. Dealing with DUI sermons, court cases, and the many other issues that arise with DUI is not easy. That is where we come in. We will do the heavy lifting when it comes to SR requirements, advise you on what to do and how to do it. All you need to do is fill in our very easy to fill form, and the rest is up to us. We will lighten the burden. Your life is precious, other people’s lives are important too. When you drink beyond the allowed limits, your judgment becomes poor. In an instance you could even kill a child. It is therefore not unreasonable to ask you to take the time to make a sober decision even before you down your first drink. 20 years in jail is a very long time to spend pondering over a wrong decision you made. If you must drink, consider hiring a cab or getting a designated driver. If the many costs associated with a DUI do not bother you, carry the thought of being a potential killer any time you DUI.